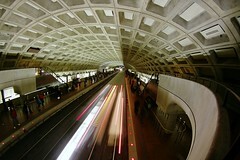 Metro is going to be closing a little early tonight, shutting down all rail service at 11pm tonight. They’re going to use the extra time to start to clear out some of the snowbound stations and try to figure out what’s going to be open on Sunday. The snow has stopped for much of the DC area, and now the long extraction process will continue. If I had to guess, I’d say it will be midday Monday before Metrobus service begins to resume, and Tuesday before it’s back toward full strength. I would suspect that the rail service will continue underground-only on the same timeline. Be safe out there DC.